Moana is not your average Disney princess flick. Just like the movie "Brave," this film was about adventure and how the main character has to help her village. Moana (voiced by Auli'l Cravalho) didn't rely on anyone with the task of saving her village except for a demi-god named Maui (Dwayne Johnson). You can tell Disney went to great lengths to make this movie and did a lot of background work before starting it. Moana dives into the Polynesian culture and we see the rich history of the people living out on the islands and how they navigated the oceans from land to land. Although I personally don't know a lot about that culture, I'm sure Disney did the best they could to get that part accurate. We are introduced to Moana, the daughter of a chief, at a young age. She is special and is chosen by the "ocean" for a task only she can do. She has always had the desire to see what is out beyond the reef of her island and see the world outside of it. Without spoiling it too much, the film proceeds and her island undergoes a negative change, so her time to save her island and people has come. She sets sail and has to convince the demi-god Maui to help her in getting where she needs to go to save her island and other islands from the evil change that is spreading. It takes a while to get his approval because he is a stubborn demi-god and really full of himself. He only agrees to help if she will do him some favors as well. Moana was an adventure from start to finish and what I really loved were the animation and the story from Disney. I liked how the ocean was made to be alive how Moana interacted with it and got help from it in good and bad times. Maui, besides being strong, can shape shift into any animal. I loved how we see someone as stubborn as Maui finally become the hero Moana needs him to be in the end. The musical score, like other Disney movies, hits the right spot and gives this film life. 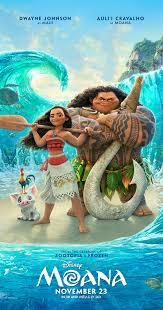 If you want to see a film where the "girl" saves the day and that has a magical ocean, rich Polynesian culture, and laughs and adventure all the way to the end, then you will walk out loving this one. Also stick around for the very last end of the credits because there's a minor scene which pokes fun at an old Disney classic character name.